On Friday, a relaxed road trip from Orange County to Ventura County that normally takes a couple hours turned into a rush hour traffic commute that stretched out to 4 hours – almost the same time as driving to Las Vegas. Not sure what was going on, but we finally made it to Oxnard just in the nick of time for the Professional Division Salsa judging at La Dolce Vita in Heritage Square. 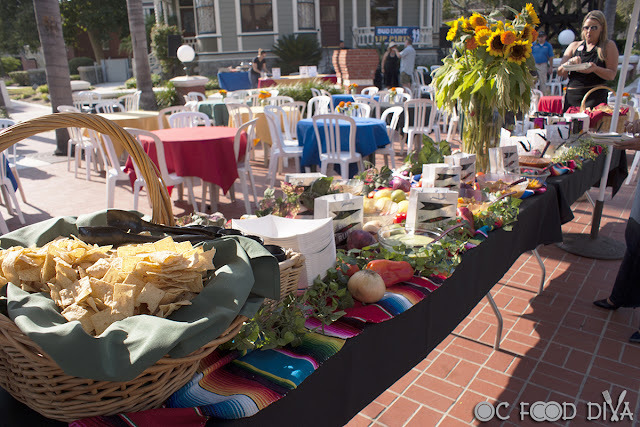 Heritage Square is celebrating its 25th anniversary this year. It is a collection of turn-of-the-century homes and other buildings that were all moved to this square, restored, and are now the home to restaurants, shops, and even a wine tasting room. 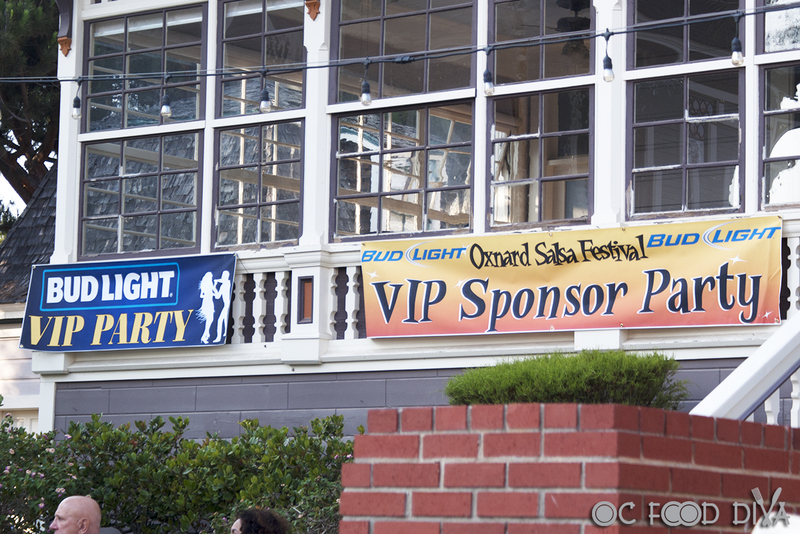 Immediately following the judging was the VIP Sponsor Party where guests were treated to some tasty bites as well as vote for the People’s Choice for the best Professional Division Salsa. 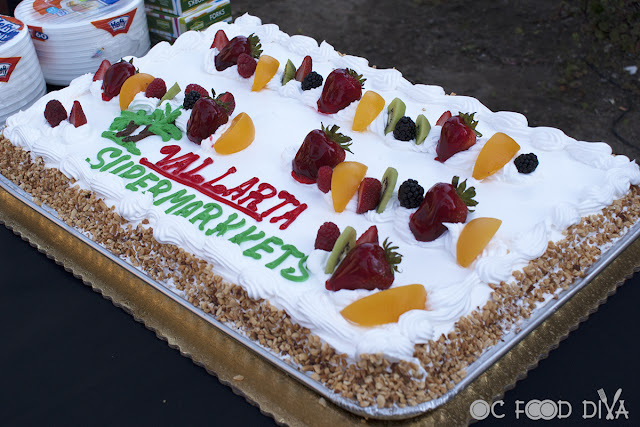 Vallarta Supermarkets served up a Chipotle Cream Chicken Penne Pasta and Tres Leches Cake. The pasta was a like a fusion of Italian and Mexican flavors. 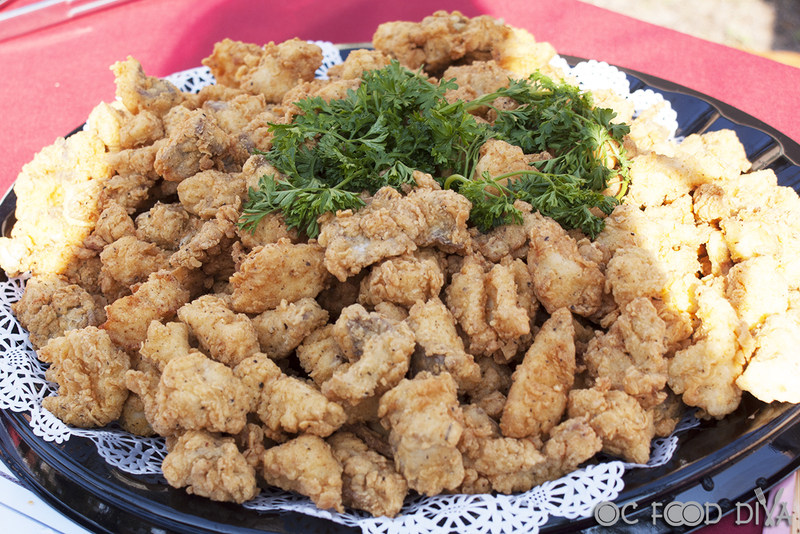 It was rich and hearty for an entrée yet a great dish to serve banquet-style. The tres leches cake was amazing! It was light yet creamy and decadent. 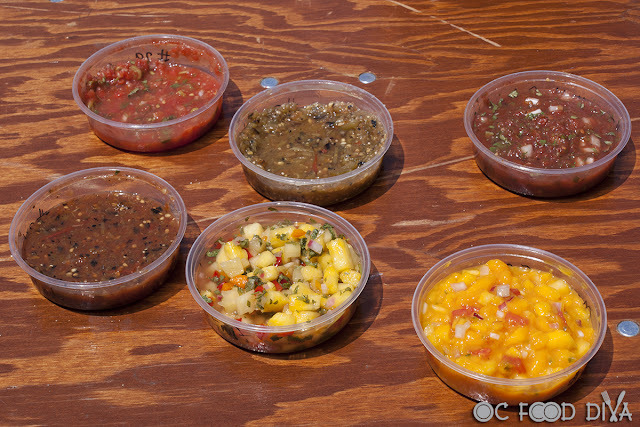 A buffet of the Professional Division Salsas was setup up in the middle of the party so everyone could cast their vote. And the winner is…BG’s Café! Otani’s served up their Season Fried Red Snapper and Tempura Vegetables. Their season fried red snapper is so oishi! 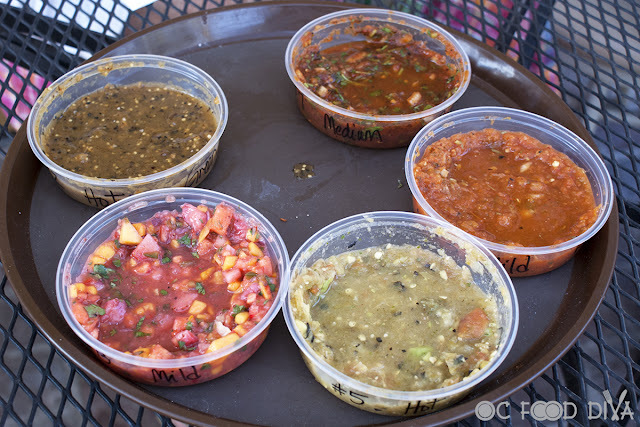 I would love to get the Izzy Special the next time I’m in town. The tempura vegetables were a nice light side. La Vero’s Restaurant served up ceviche and carne asada nachos. 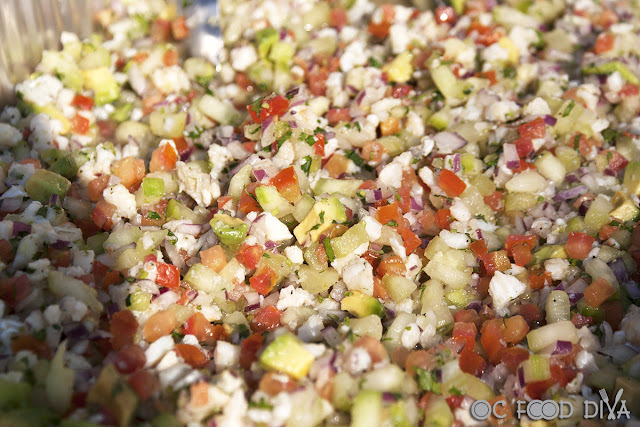 The ceviche was clean, crisp, and not overly citrusy. The chopped pieces lent themselves well for dipping with chips. The carne asada nachos was “muy delicioso”! 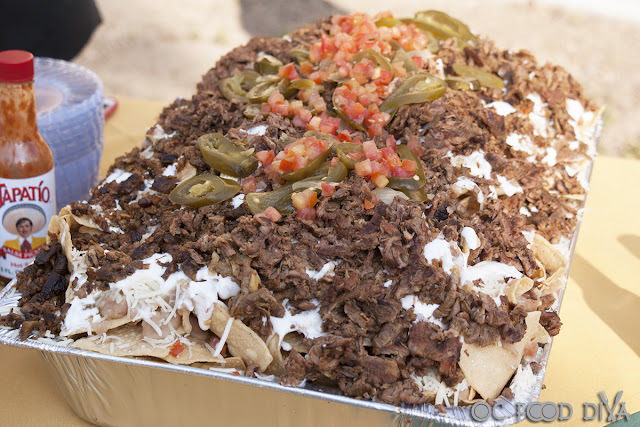 This meaty behemoth was covered with carne asada, queso, crema, jalapenos and tomatoes. I would love to have that as an appetizer in the restaurant. 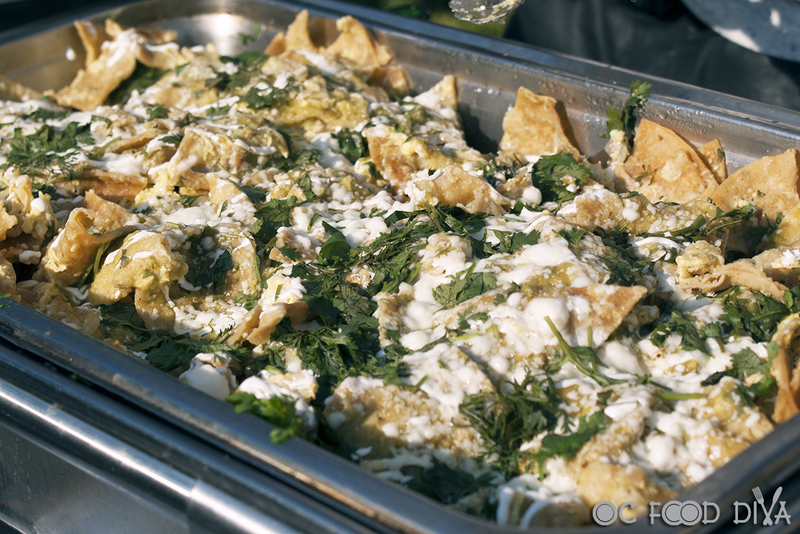 Tomas Café served up Jesus’s Chilaquiles made with tortilla chips, green sauce, queso fresco, sour cream, and cilantro. 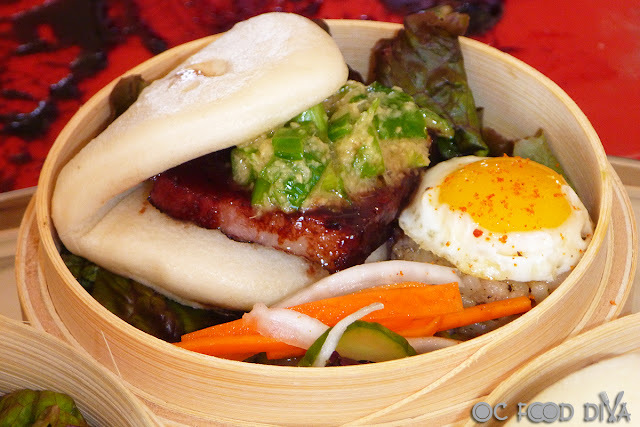 I would definitely order this at the restaurant with two sunny side eggs on top! 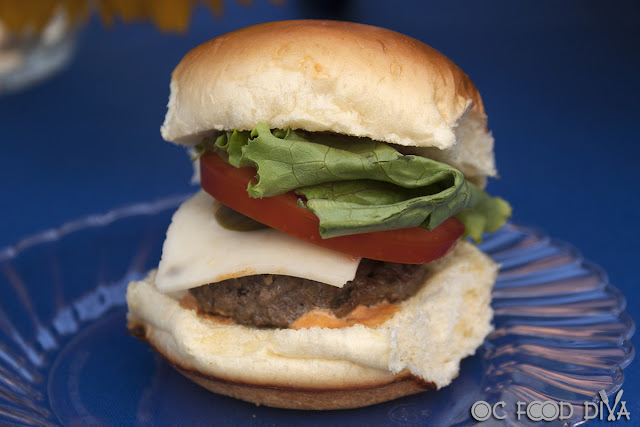 Fresh & Fabulous Café served up their Spicy Burger in slider form which is topped with pepper jack, jalapeno, tomato, red onion, lettuce, and chipotle aioli. 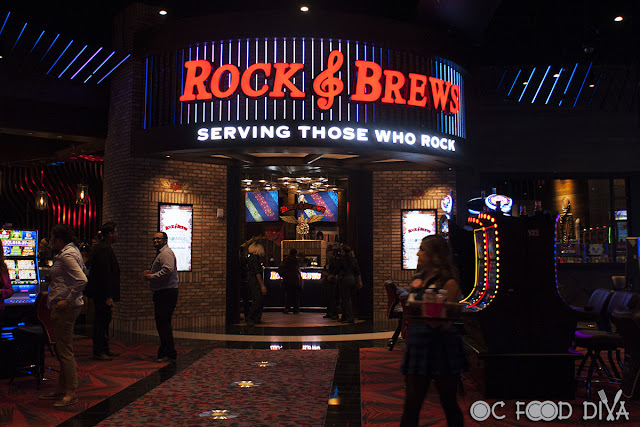 They just recently moved to 5th Street near the movie theaters and are opening on August 20th. 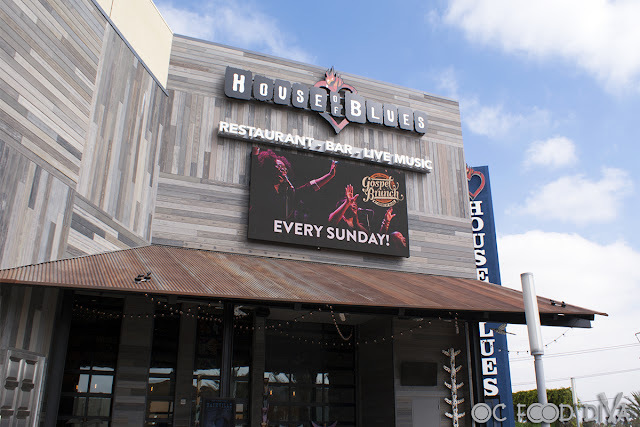 Lots of great stuff on the menu for breakfast, brunch, and lunch ranging from breakfast entrees like omelets and pancakes to lunch entrees like burgers, sandwiches, and salads. I would love to try their Barbacoa Eggs next time I’m in town. The evening ended with a walk to Plaza Park for the kick-off concert with Cecilia Noel & ‘The Wild Clams’. 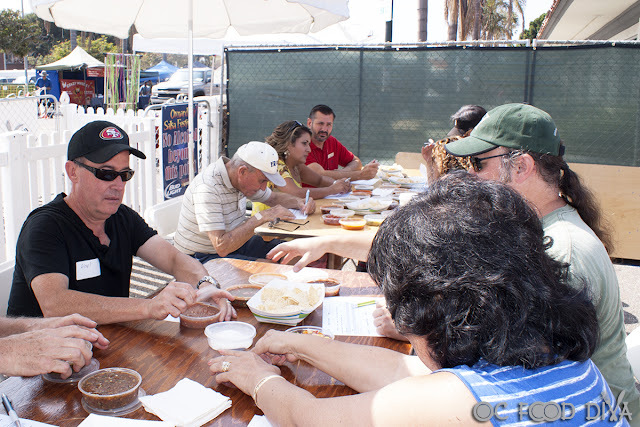 On Sunday morning before the festival opened for the day, a new group of judges was rounded up to judge the Amateur Division Salsa Recipe Competition. 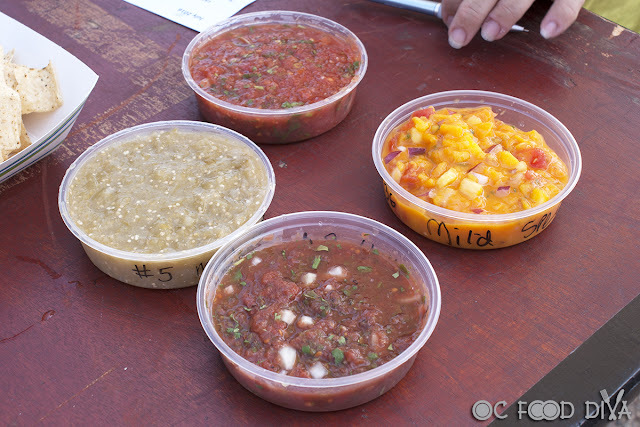 Our group judged the mild and medium at first. We were armed with Mission tortilla chips and sour cream. Judges in the foreground judged the mild and medium categories while the judges in the background judged the hot and specialty/fruit categories. Ice cold water, margaritas, and beer were served to cool us off as the sun’s rays started to beat down upon us. The medium category had a huge amount of entries! 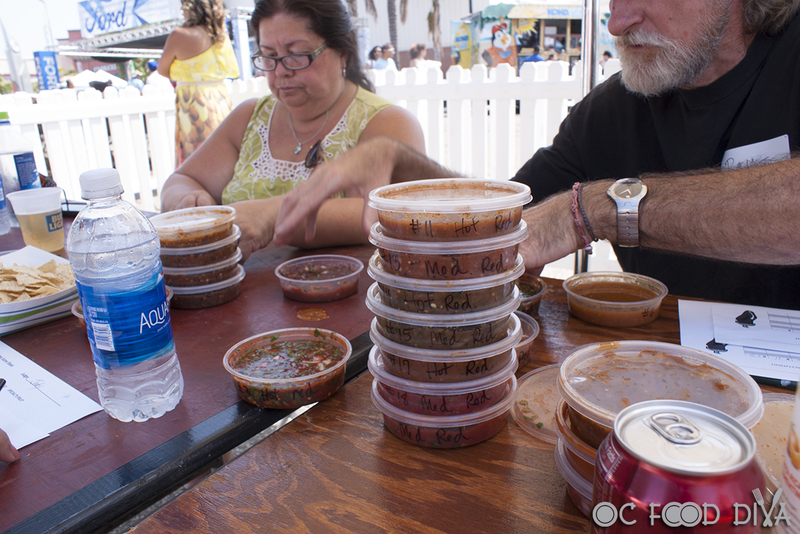 It was lunch time when we were done judging, but the hubby and I were too full from the yummy salsa and chips to indulge in any of the tasty treats available. 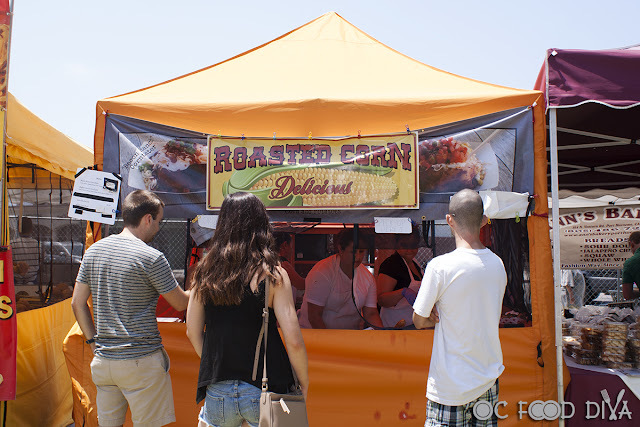 The festival has a huge food court serving a wide variety of different foods. Watch the YouTube video to see various selections. Mom loves roasted corn and simply had to grab a cob! 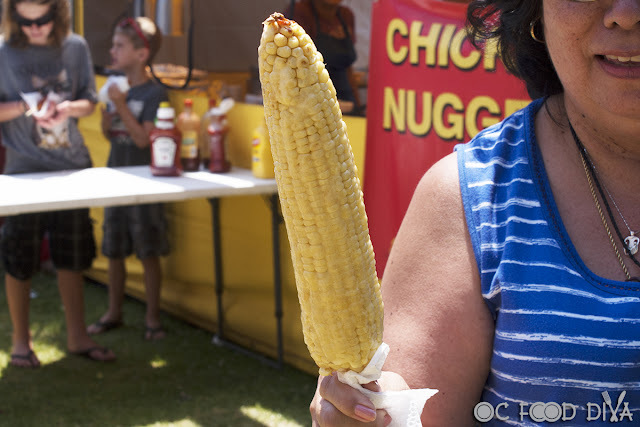 She loves it with butter so the sweetness of the corn can shine through. 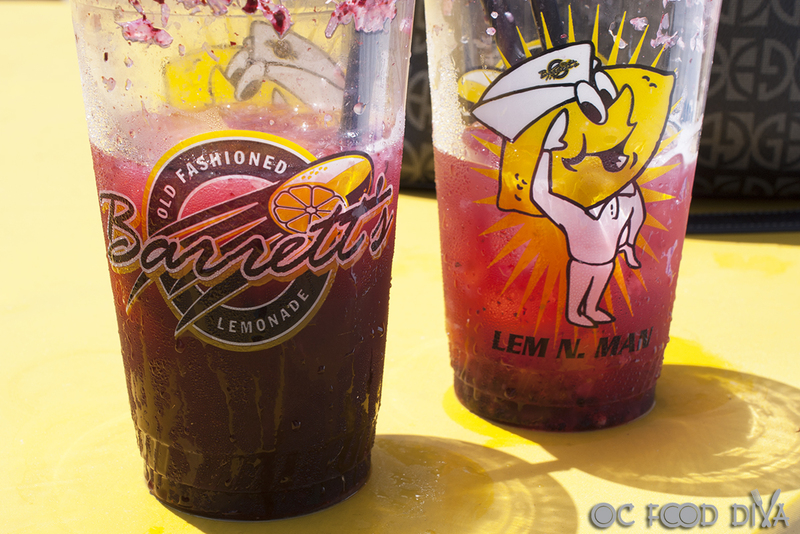 With the sun shining bright, Barrett’s Lemonade came to the rescue with their Blueberry Lemonade. 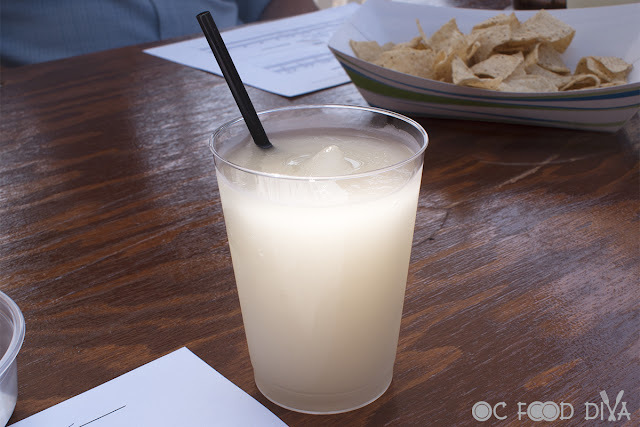 We always grab a glass of their wonderful lemonade every time we attend this festival. It is ice cold and goes well with anything you eat with it. Another year of the Oxnard Salsa Festival is over, but make plans to attend next year’s festival!